Over the past century, essential nutrient deficiencies have dramatically decreased, many infectious diseases have been conquered, and the majority of the U.S. population can now anticipate a long and productive life. However, as infectious disease rates have dropped, the rates of noncommunicable diseases—specifically, chronic diet-related diseases—have risen, due in part to changes in lifestyle behaviors. A history of poor eating and physical activity patterns have a cumulative effect that have contributed to significant nutrition- and physical activity-related health challenges that now face the U.S. population. Nearly half of all American adults have one or more preventable chronic diseases, many of which are related to poor quality eating patterns and physical inactivity. These include cardiovascular disease, high blood pressure, type 2 diabetes, some cancers, and poor bone health. More than two-thirds of adults and nearly one-third of children and youth are overweight or obese. These high rates of overweight and obesity and chronic disease have persisted for more than two decades and have come with increased health risks at high cost. In 2008, the medical costs associated with obesity were estimated to be $147 billion. In 2012, the total estimated cost of diagnosed diabetes was $245 billion. Concurrent with these diet-related health problems persisting at high levels, trends in food intake over time show that, at the population level, Americans are not consuming healthy eating patterns. For example, the prevalence of overweight and obesity has risen and remained high for the past 25 years, while Healthy Eating Index (HEI) scores, a measure of how food choices align with the Dietary Guidelines, have remained low. Similarly, physical activity levels have remained low over time. The continued high rates of overweight and obesity and low levels of progress toward meeting Dietary Guidelines recommendations highlight the need to improve dietary and physical activity education and behaviors across the U.S. population. Progress in reversing these trends will require comprehensive and coordinated strategies, built on the Dietary Guidelines as the scientific, evidence based foundation that can be maintained over time. The Dietary Guidelines are an important part of a complex and multifaceted solution to promoting health and helping to reduce the risk of chronic disease. These evidence based guidelines translates science into succinct, food-based guidance that can be relied upon to help Americans choose foods that provide a healthy and enjoyable diet. Its recommendations are ultimately intended to help individuals improve and maintain overall health and reduce the risk of chronic disease—its focus is disease prevention. The Dietary Guidelines are not intended to be used to treat disease. Regardless of an individual’s current health status, almost all people in the United States could benefit from shifting choices to better support healthy eating patterns. Thus, the Dietary Guidelines may be used or adapted by medical and nutrition professionals to encourage healthy eating patterns to patients. Many factors influence the diet and physical activity choices individuals make. Income and life circumstances also play a major role in food and physical activity decisions. Significant health and food access disparities exist, with nearly 15 percent of U.S. households unable to acquire adequate food to meet their needs because of insufficient income or other resources for food. These factors—along with the settings in which people live, learn, work, and play—can have a profound impact on their choices. People do not eat foods and nutrients in isolation but in combination, and this combination forms an overall eating pattern. A growing body of research has examined the relationship between overall eating patterns, health, and risk of chronic disease, and findings on these relationships are sufficiently well established to support dietary guidance. Making changes to eating patterns can be overwhelming. That’s why it’s important to emphasize that every food choice is an opportunity to move toward a healthy eating pattern. Small shifts in food choices—over the course of a week, a day, or even a meal—can make a big difference. There are multiple opportunities to improve food choices throughout the day and in varied settings where food is obtained and consumed. Small shifts made at each of these many eating occasions over time can add up to real improvements in eating patterns. 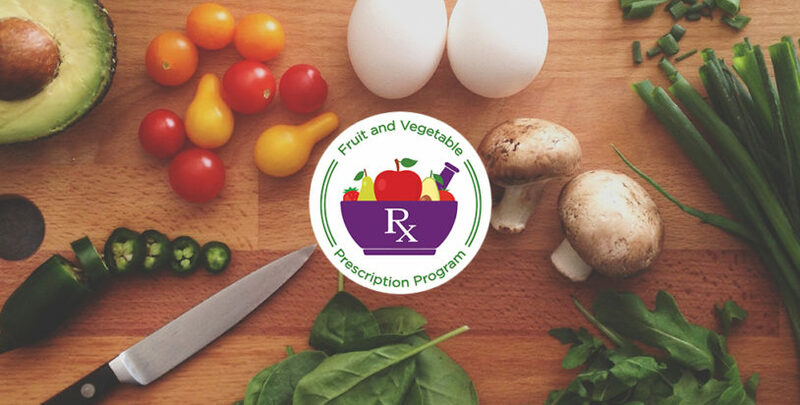 The Shape Up North Fruit and Vegetable Prescription Program is designed to help patients with chronic disease shift their eating patterns to align with the evidence based Dietary Guidelines. Creating a healthy eating pattern and filling half of My Plate with fresh fruits and vegetables is an evidence based way to improve health and reduce the risk of chronic disease. The Program identifies patients with chronic disease risk factors and refers them to structures nutrition education classes with cooking demonstrations and tastings. These classes take place at local farmers markets where they attend classes to receive market coupons to redeem for fresh fruits, vegetables and seedlings. The goal is to provide the tools patients need to shift to healthier eating patterns. The Fruit and Vegetable Program also provides valuable community linkages between farmers, health care providers and the community.